Here are some excerpts taken from my diary from January 1974 onwards. Now I’m 45 it all looks a bit silly, but hope you can relate to some or all of it! Sit back and enjoy the journey through Top of the Pops, the Top 40 on the radio, falling out with my best friend, fashion, school and my favourite TV programmes. 2 coathangers, talc, nail varnish (2 bottles), lock-up diary, Christmas stocking and £20.00 clothes. 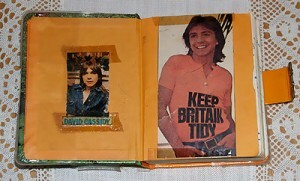 Also I got Cluedo, a record and a David Cassidy life story book. From Johnny, Pam & Jenny we got a £1.00 record token, but that was for babysitting as well. Trevor and I bought Leo Sayer’s record and Toni bought Roxy Music’s. I’ve still got to get a surprise from Cheryl & Stuart and Mick & Edy. My friends gave me lots of presents like bath cubes, bubble bath & bath salts.